I came upon this article of what was a great Soviet Union Dream at one time. When I first saw this tower about a 7 years ago I was struck in aw! It is huge, but it is less than half the size it should have been. I could not imagine if they had succeeded to get the steel to build the original plans. The prominent lattice-worked radio and television broadcasting tower on Moscow’s Shabolovka Street – the Shukhov Tower, which was built at the start of the past century, has n ever been repaired or renovated during its almost 100-year history. 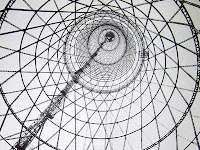 Now, experts say this unique structure – designed by Vladimir Shukhov, an outstanding Russian engineer – is in a deplorable state. Vladimir Fyodo­rovich Shukhov, the designer’s great grandson and foun­der of the Shukhov Tower Foun­dation, agreed to an interview, in which he speaks candidly about the tower reconstruction project, which includes some very interesting surprises, including the construction of an observation deck at the top of the tower. 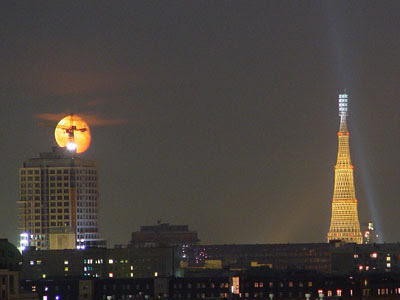 Vladimir Fyodorovich, what is the status of the tower, one of Moscow’s architectural landmarks? Most international experts acknowledge the Shukhov Tower as one of the most beautiful and prominent achievements of engineering, a masterpiece of engineering art. But unless urgent measures are taken to save it right now, the tower may simply be lost within the next decade. The tower, which served as support for radio and television antennas for 85 years, has never been renovated and is in poor repair. Unfortunately, nothing is being done to improve the situation. Here, I need to say a few words about the tower’s technical characteristics. My great grandfather was the first engineer in the world to use the lattice-style technique. 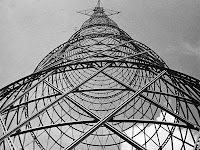 Due to its latticed structure, the Shukhov Tower’s steel shell is subject to minimum wind load, which is the main hazard for high-rise structures. 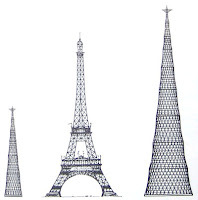 The lattice steel structure combines strength and lightness: three times less metal per unit of height was used on the Shukhov Tower than on the Eiffel Tower. It was projected to attain the height of 350 meters with a mass of just 2,200 tons, whereas the Eiffel Tower, with a height of 305 meters, weighs 7,300 tons. Due to a shortage of steel during the Civil War in Russia, the tower only reached a mere 148.5 meters. The tower’s round conical frame is comprised of six sections, 25 meters each. The lower section rests on a concrete foundation with a diameter of 40 meters, three meters deep. During its 85-year history the Shukhov Tower has served as a support for radio and TV station antennae. On March 19, 1922, the unique tower on Shabolovka went into operation. In your view, what steps should be taken to preserve the tower? The Shukhov Tower Foundation has for the past several years been campaigning to develop the area around the tower. European experience in the restoration of unique architectural structures requires that appropriate surrounding infrastructure. Presently, the tower is not being used according to its original function – i.e. to retransmit radio and TV signals. Therefore, it is necessary to approach its reconstruction in a comprehensive manner, integrating adjacent territory into the project. 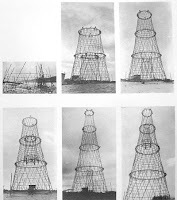 We believe that a scientific/art center named after Shukhov could be constructed around the tower – a modern business, technological and cultural complex. The complex could comprise a business center, congress hall, a center of culture and arts, and possibly an interactive museum to Vladimir Shukhov and his followers. My great grandfather was an excellent photographer/artist: he has left behind about 2,000 high-quality photos on glass, which could be exhibited. How could the tower be used in the future? A small observation deck could be built on top of the tower, which must not, however, affect the lightness of the entire structure. The idea is only to build a small observation platform on the penultimate level, at 125 meters above the surface – just like the one on the Eiffel Tower. Another option is to provide “virtual excursions” to the tower’s highest point – offering a panoramic view of Mos­cow: visitors will be able to admire the sights of the capital via video cameras attached to the top of the tower while sitting in a cafe on ground level. What hampers the project’s implementation? The territory around the tower belongs to different organizations and agencies – for example, units of the All-Russia State Television and Radio Broad­casting Company (VGTRK). Needless to say, until a decision concerning the use of the land around the tower is made at the state level, we cannot really consider attracting investors or launching the project. We already have investors who are interested in this project, but no one will want to sink money in developing a territory that belongs to a host of legal entities. Apart from its moot property status, the land under the tower is surrounded by a closely guarded belt, 50 to 300 meters wide, and it is almost impossible to come close to the tower as such. In Paris, avenues and alleys lead to the famous Eiffel Tower, and tourists can walk around it at their leisure. For our tower to become a kind of a public attraction, it should be accessible with a recreational zone around it. How much money is needed to carry out your project? Before starting the work to restore the tower, it is necessary to examine it thoroughly. The last such examination was made more than five years ago. Its results indicate that the metal structure has aged and worn down considerably. But the situation is not catastrophic, and with modern technology the tower can be restored fairly quickly. At the same time, in order to determine concrete methods and the time frame for reconstruction, another, more detailed expert examination is needed. This requires more money than we have available at the moment. In our estimate, such an examination may cost from 1 million to 3 million rubles ($40,000 to $120,000), but it turns out that the Russian Television and Radio Broadcasting Network, on whose balance sheet the tower is listed, does not intend to provide these funds, since it has stopped using the tower as a retransmission facility. Our proposal is being considered by various bodies of legislative and executive power, but thus far without result. I believe that the only agency that can get the project off the ground is the Moscow city government. The city authorities plan to create a tourist route, called Glass Street, which will be a pedestrian mall under a glass roof leading from Shabolovka Street to Europe Square at the Kiev railway terminal. Since the Shukhov Tower is at the start of this route, the planners completely supported our concept for preserving the tower and incorporating it into the Glass Street project. Moscow City Hall realizes that making the Shukhov Tower into a tourist attraction will bring additional investment to the city treasury. But before the city government can take on the project, it is critical to transfer the tower and the adjacent area to city ownership. Private investors could also be attracted to the project – both at home at abroad. Few people deny that the Shukhov Tower is in need of reconstruction, but on the other hand, the relevant agencies are doing little to put the plan into action. To allow this tower to deteriorate is a shame. Land marks like this are almost impossible to replace. As we modernize our world we should not forget the past……..
Moscow almost had a tower larger than the Eiffel Tower, Now that is Cool!